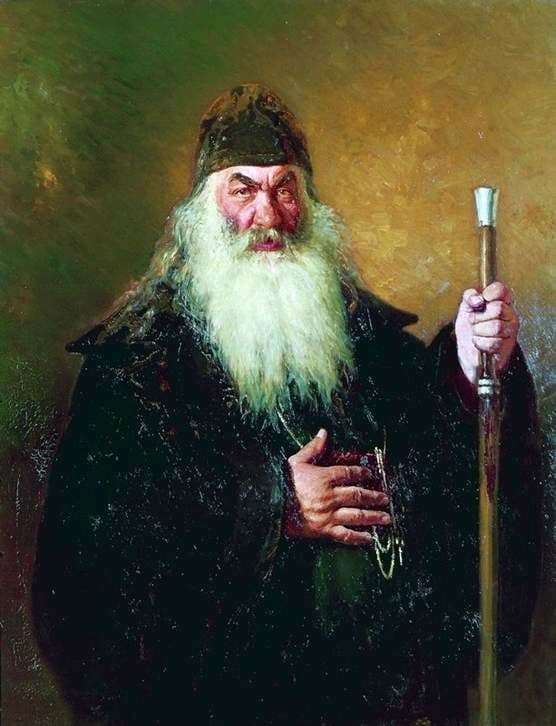 Ordinary portrait of Protodeacon I. Ulanov from Chuguev, the most famous artist Ilya Repin, skillfully turned the satirical image of a deacon, typical of that time, with great life potential, but without spirituality and kindness, because life conditions make him hypocrite all the time. The talent of the painter is clearly obvious, as he uses a rich, pronounced style of writing and gives the image inconsistency. The appearance of the protodeacon is a complex figure with a strong torso, the shoulders of a real hero, a long gray beard, in the frame of which the fleshy cheeks turn purple. The master of the brush presented the vitality and integrity of the image with various painting techniques. The deacon is clad in an expensive robe, and his head is covered with dark-dwarf skufye. On the chest one can see a fold hanging on a chain of silver, which the deacon holds with a right-handed person; in his left hand he holds an enormous staff decorated with stones. The face is clearly marked with a thick, reddened nose. Eyebrows are very thick, and from under them are looking intently greedy eyes. It seems that the person in the picture is watching what is happening. The mouth is half-opened, it is felt that the Chuguev protodeacon breathes heavily. Perhaps the effects of drinks after the evening feast. The image on the painter’s canvas is a strong nature, but primitivism, rudeness emanate from it, the protodeacon is not alien to sinful thoughts that are too far from biblical principles. The artist very subtly with the help of paints combines two opposite points of view: he admires the naturalness of human nature, but exposes the depravity of man. The painter created one of the brightest protodeacon images, and the painting itself exposes the essence of the church and the clergy and carries a deep artistic meaning.